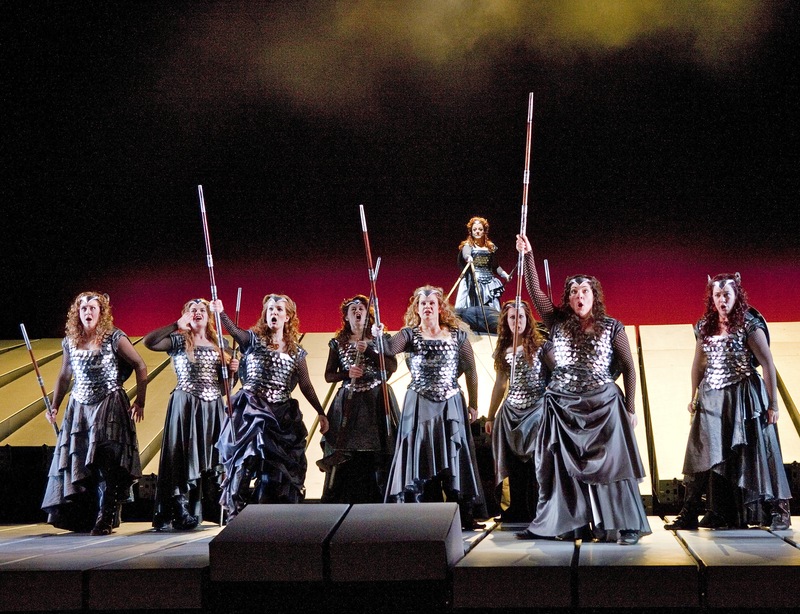 In the fall of 2012, our local PBS station aired the New York Metropolitan Opera’s recent production of Wagner’s Ring Cycle. I was feeling ambitious, so I decided to watch, and OMG, the costumes. THE COSTUMES!! The Valkyries (in Die Walkure) were breathtaking. Here they are in one of the most famous moments in opera: “Ride of the Valkyries.” (“Kill the wabbit! Kill the wabbit!” You know it.) Click (and zoom) to see them in all their magnificence. The Valkyrie in back is the title Valkyrie, Brunnhilde, played by soprano Deborah Voigt, riding to join her sisters in battle, and disobey her father, Wotan (Odin), by sparing Sigfried’s life. Valkyries are Norse goddesses of war who inspire warriors on the battlefield and handpick the honored dead who will await Ragnarok, the final battle, in Valhalla. 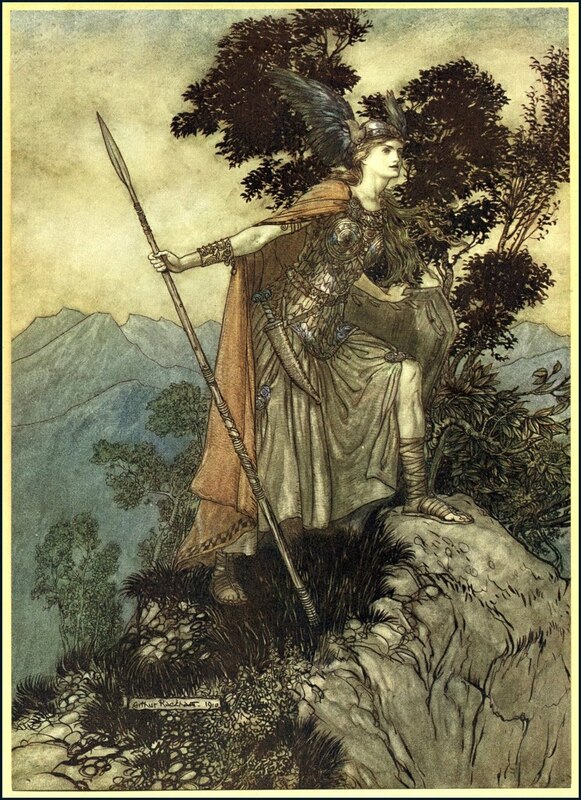 Their name, valkyrja, means “choosers of the slain,” and they have individual wonderful names like Mist (mist), Goll (turmoil), Skeggjold (axe age), and a number of names ending in –hild, which means “maiden,” including Brynhildr (shield maiden) and Ragnhildr (spear maiden). Enough history! Back to the costumes. 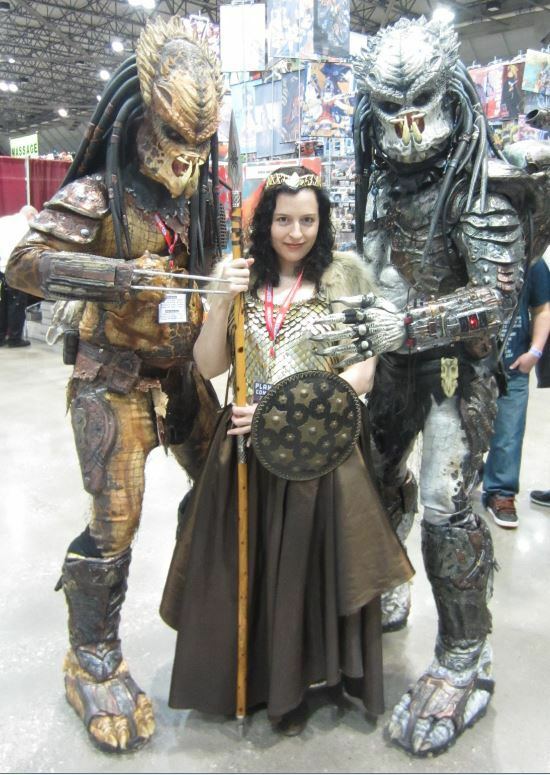 They are the work of Canadian costume designer Francois St. Aubin, and consist of gorgeous scale mail bodices topping a variety of frothy, ruffly, bustled, almost Steampunk-inspired pewter silk skirts; and heavy, tromping boots; spears; and shields. Don’t they look amazing! I wanted one immediately, and thereafter spend the next several months daydreaming about it—but not seriously considering it, and for one very good reason: I am a seamstress. I don’t do armor, nor do I really want to do armor. And without that armor, such a costume would be completely pointless. 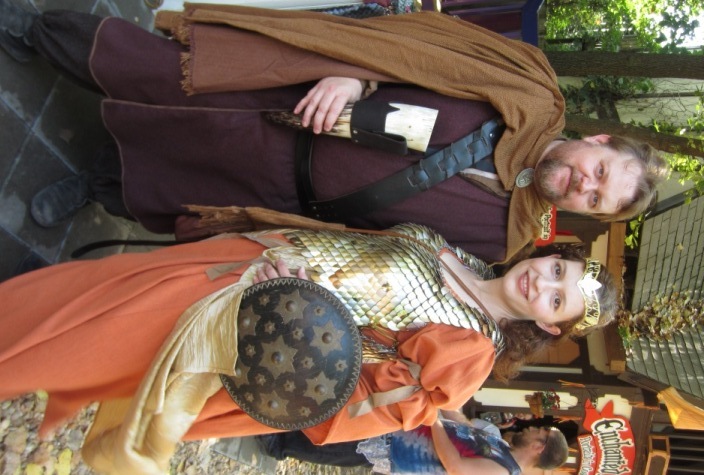 And then, Milord found these people—Amanda and Mike O’Leary of Amanda Lynn/Fairytale Chainmaille, at Planet Comicon. They were as excited by the idea as I was, and we got to work. We decided on a slightly different color scheme, and while they set about planning how to make a similar bodice, I started sourcing frothy gold fabrics, and ruffly skirt patterns. As it happened, Amanda and Mike work much more efficiently than I do, and they actually got their part done in time for KCRF opening weekend. The prospective Valkyrie herself? Er, not so much. 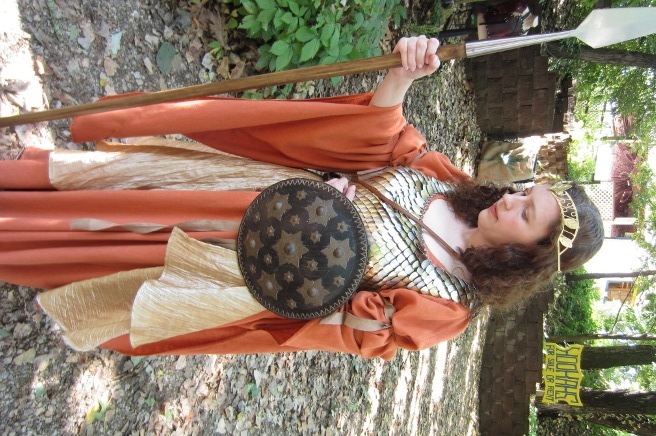 So here is my interpretation of the Met Valkyries—so far—paired with my trusty Flaming Orange Chemise (which evidently goes with everything), and a gold crinkle taffeta wrap skirt. My buckler (shield) is a screen-used movie prop first seen in “The Ten Commandments,” and the spear is a loaner from a friendly KCRF merchant. 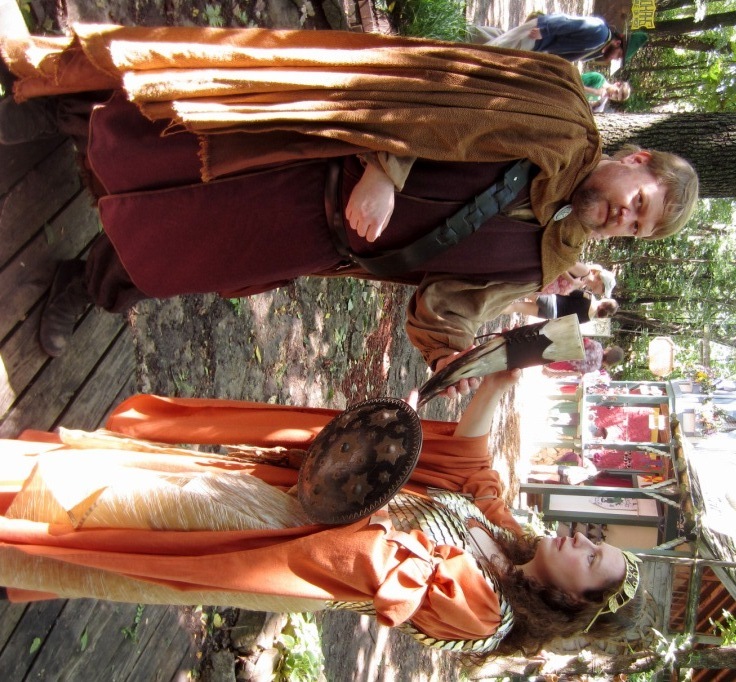 Serving mead to my (thankfully not fallen!) hero. First new addition, October 2013: A fur shrug! Not part of the original inspiration, but clearly essential nonetheless! Details TK on making the shrug. Easy-peasy, and I’ll have a pattern to share, too. 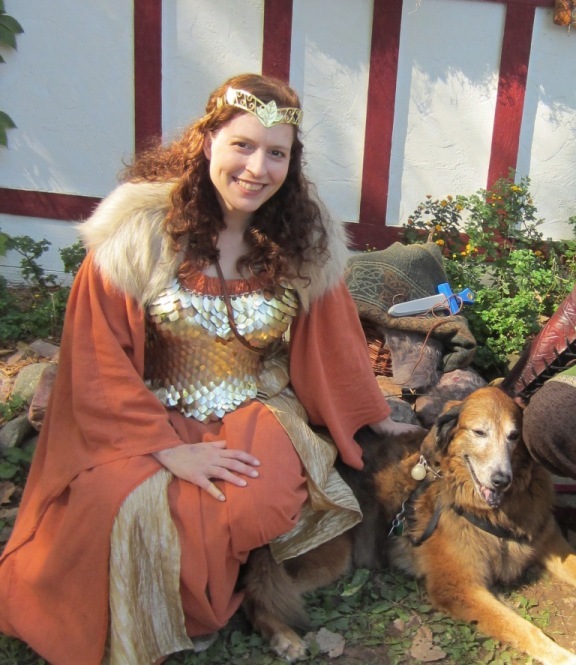 UPDATE March 2014: Although I love the original Flaming Orange incarnation of this ensemble, I still wanted to get closer to the inspiration costumes, and I debuted a bronze taffeta skirt at Planet Comicon this year. 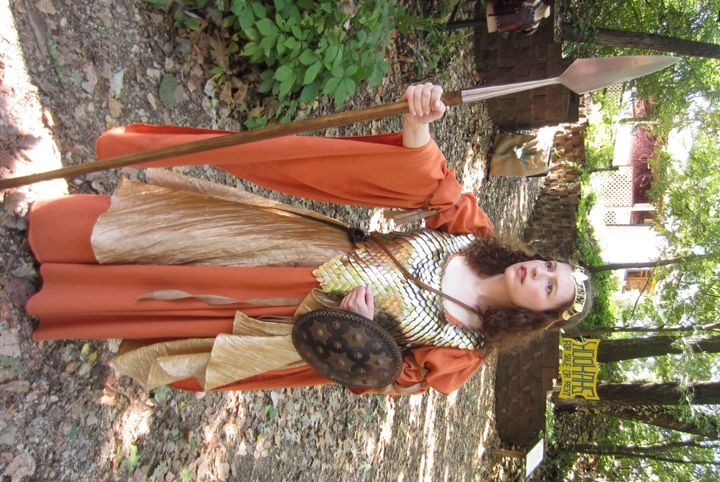 Not visible are a matching bronze/copper metallic tank top and a gold midbust corset.